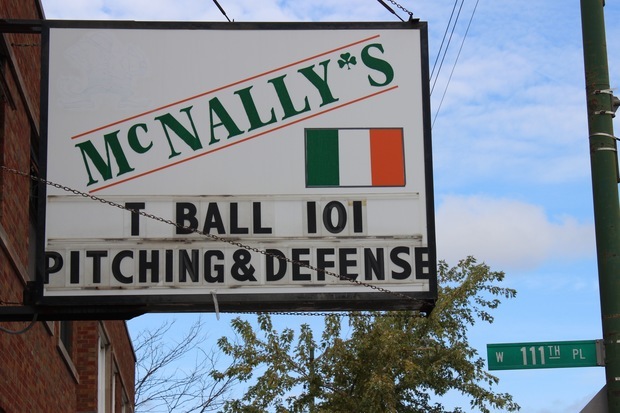 McNally's in Morgan Park has a long tradition of taking jabs at fans of the Chicago Cubs. The bar at 11136 S. Western Ave. doled out a parting shot on Thursday after the North Siders were bounced from the playoffs. MORGAN PARK — McNally's in Morgan Park isn't hiding its revelry after the post-season sweep of the Chicago Cubs. The bar at 11136 S. Western Ave. posted a sign on its marquee Thursday that read, "It's Always Been Next Yr - 108 Times." The south-facing side of the sign read, "T Ball 101, Pitching & Defense." The Southwest Side tavern has a history of taking jabs at the North Siders and their fans. Its opposition took on new life when the Cubs entered the playoffs. McNally's chiding of the Cubs even made national headlines earlier this month when it offered free beer every time the St. Louis Cardinals hit a home run against the Cubs in the National League Division Series. 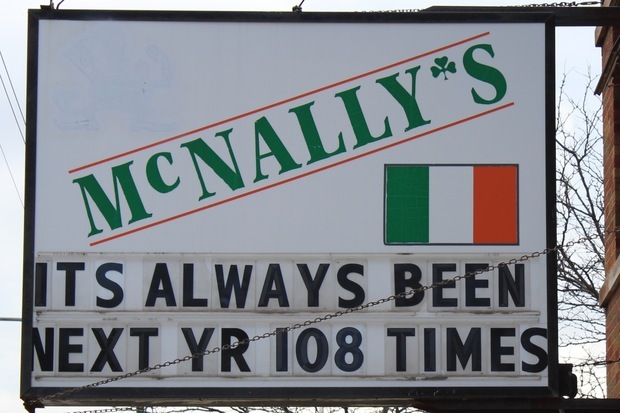 McNally's in Morgan Park posted its latest jab at fans of the Chicago Cubs on Thursday. The bar at 11136 S. Western Ave. may want to think about its message though, since technically there isn't pitching in T-ball. The Cubs went on to win the series, and McNally's later clarified via its Facebook page that the rivalry was all in good fun and the suds were being bought by an enthusiastic Cards fan. The Cubs were swept 4-0 by New York Mets in the National League Championship Series at Wrigley Field on Wednesday night.